Home/Animals and Sound/Sound Production/How do marine mammals produce sounds? Mammalian vocalizations are produced by the actions of the larynx, a set of tissues located in the throat. The larynx contains folds of tissue called the vocal cords (also called vocal folds), which vibrate as air passes from the lungs into the oral cavity (also called the mouth). 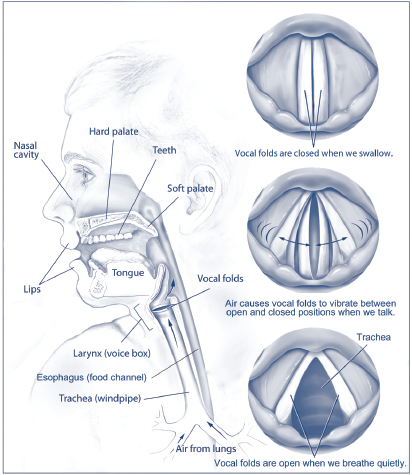 The shape and tension of the vocal cords can change to produce different sounds. The sounds can be affected by changes in the shape of the buccal cavity, tongue, and lips. All species of marine mammals are known to make sound. Marine mammals produce sounds that are used for communication, feeding and navigation. Almost all sounds produced by mammals result from the movement of air through different tissues. Marine mammals produce vocalizations using mechanisms similar those of land mammals. Pinnipeds (seals and sea lions) have a larynx similar to that of humans. Baleen whales also use a larynx to produce sounds. 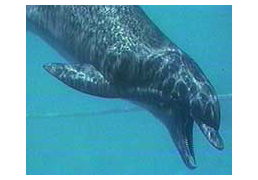 Toothed whales can produce sounds using their larynx as well as specialized air sacs near their blowhole. The larynx is used to produce whistles, while the air sacs are used to produce high frequency echolocation signals. Dolphins produce sounds by passing air through air sacs in their head. Adapted from Dolphin Acoustical Structure (1991) Scheifele, P.M. NUSC TR3080. Pinnipeds, polar bears, and sea otters produce sound in air and in water and have sound production mechanisms like those of land mammals. Their aerial vocalizations have been described as barks, cries, grunts, howls, roars, snorts, and squeaks. Underwater vocalizations are described as bell-like sounds, clicks, trills, warbles, and whistles. Sounds are produced by vibration of the vocal folds in the larynx as air passes from the lungs through the larynx, into the throat, and out through the mouth. The sound produced by the larynx is modified by changes in the position and shape of the animal’s buccal cavity, tongue, and lips. 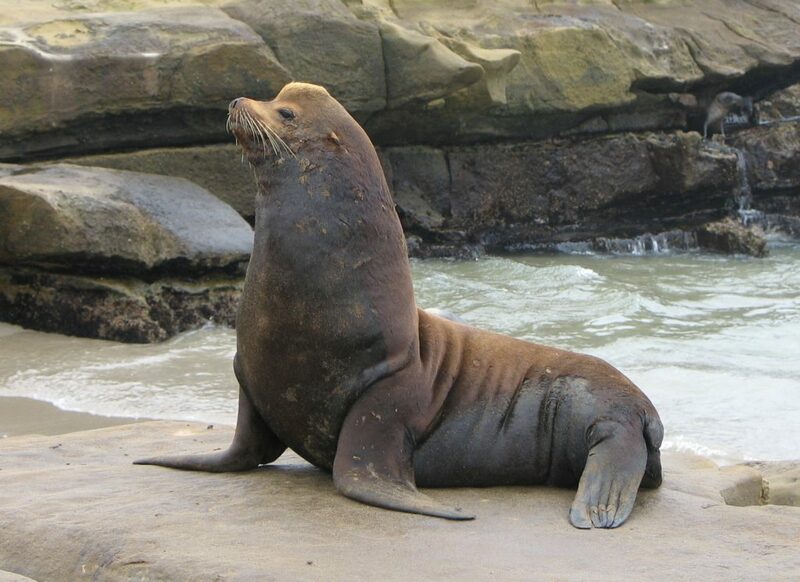 Male California sea lions, like the one pictured above, bark profusely when defending their territories. In air, these sounds are produced using the same mechanisms that humans use. Image credit: NOAA. Odontocetes (toothed whales) produce a wide variety of sounds, which include clicks, whistles, and burst pulses. Some lower frequency sounds may be produced by the larynx. Most sounds, especially the higher frequency sounds, are produced by a complex system of air sacs and specialized soft tissues that vibrate as air moves through the narial passages. The sound produced in the air sacs is channeled through the fats of the melon. The melon shape can be modified by the animal to produce a narrow or broad beam of sound. In contrast to odontocetes, current science indicates that mysticetes use only a larynx for sound production. Inside the larynx is a thick, u-shaped, ridge of tissue (the u-fold, that is homologous to the vocal folds of other mammals). It is located adjacent to the laryngeal sac, a large inflatable “pouch”. Baleen whales contract muscles in the throat and chest, causing air to flow between the lungs and the laryngeal sac. Alternating expansion and contraction of the lungs and sac drives air across the u-fold, causing it to vibrate and produce sound. Vibrations from the laryngeal sac may propagate through the ventral throat pleats into the surrounding water as sound waves. Changes in the laryngeal sac shape may alter the frequency and/or amplitude of sounds produced. Schematic diagram displaying a potential mechanism for sound production in baleen whales. 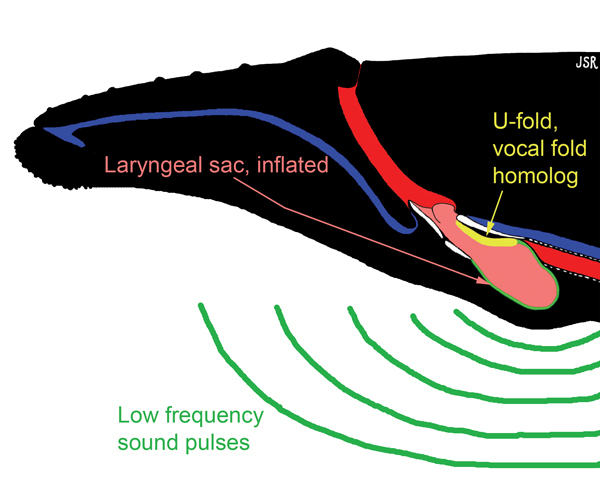 Baleen whales contract muscles in the throat and chest, causing air to flow between the lungs and the laryngeal sac (pink tissue in the diagram). Alternating expansion and contraction of the lungs and sac drives air across a u-shaped ridge of tissue, the u-fold (yellow), causing it to vibrate and produce sound. Vibrations from the laryngeal sac (green lines) may propagate through the ventral throat pleats into the surrounding water as sound waves. Note: the respiratory tract of the whale is shown red, digestive tract in blue, and associate cartilage in white. Image credit: Dr. Joy Reidenberg. Adapted from Joy S. Reidenberg and Jeffrey T. Laitman. 2007. Discovery of a low frequency sound source in Mysticeti (baleen whales): Anatomical establishment of a vocal fold homolog. The Anatomical Record. Volume 290, Issue 6, pages 745–759. Marine mammals produce other sounds by slapping parts of their body against the surface of the water. Tail or flukeslapping is commonly done by cetaceans. Humpback whale tail slaps produce broadband (30-12,000 Hz) sounds. Bottlenose dolphins also use their tails to produce sound. Kerplunks are sounds made when a dolphin lifts its tail and lower body out of the water and crashes it down on the water surface. This causes a loud splash and creates a trail of bubbles under the water. Other parts of the body that are typically used in producing noise in a slapping manner are pectoral flippers and the entire body during lunges and breaches. Dolphin kerplunk. Courtesy of Connor, Heithaus, Berggren and Miksis. 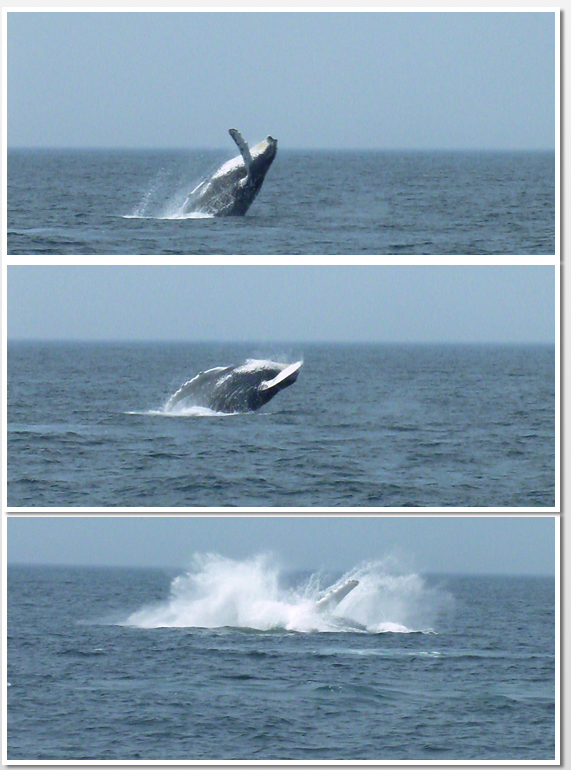 The sound of humpback whales crashing onto the surface of the water can be heard underwater. Photo credit: Holly Morin. Jaw claps are made above and underwater by forcefully closing the upper and lower jaws. These types of sound often signal aggression by toothed whales. Marine mammals make a variety of sounds that may be used for acoustic communication. Bottlenose dolphins make a “bang” sound when they clap their jaw. Photo ©Tom Kieckhefer. King, J. E. (1983). Seals of the world. London]; St. Lucia: British Museum (Natural History) ; University of Queensland Press. Norris, K. S. (1968). The evolution of acoustic mechanisms in odontocete cetaceans. In E. T. Drake (Ed. ), Evolution and Environment (pp. 297–324). New York, NY: Yale University Press. Pabst, D. A., Rommel, S. A., & McLellan, W. A. (1999). The Functional Morphology of Marine Mammals. In J. E. Reynolds III & S. A. Rommel (Eds. ), Biology of Marine Mammals (pp. 15–72). Washington D.C.: Smithsonian Institution Press. Ridgway, S. H., & Carder, D. A. (1988). Nasal Pressure and Sound Production in an Echolocating White Whale, Delphinapterus leucas. In P. E. Nachtigall & P. W. B. Moore (Eds. ), Animal Sonar (pp. 53–60). Boston, MA: Springer US. Wartzok, D., & Ketten, D. R. (1999). Marine Mammal Sensory Systems. In J. E. I. Reynolds & S. E. Rommel (Eds. ), Biology of Marine Mammals (pp. 117–175). Washington D.C.: Smithsonian Institution Press. Wells, R. S., Boness, D. J., & Rathbun, G. B. (1999). Behavior. In J. E. I. Reynolds & S. A. Rommel (Eds. ), Biology of Marine Mammals (pp. 324–422). Washington, D.C.: Smithsonian Institution Press.